Relax and enjoy authentic tropical sounds. 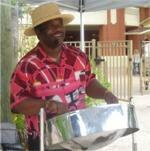 Steel drum is the featured instrument and is accompanied by computerized drums and sequences. Dressed in white slacks and matching colorful print shirt his repertoire includes all the Calypso and Island favorites.